The trip would not have happened; however, without the efforts made by Profs. Ji Hoon Heo and John Baker, as well as Dr. Mark Dolan. 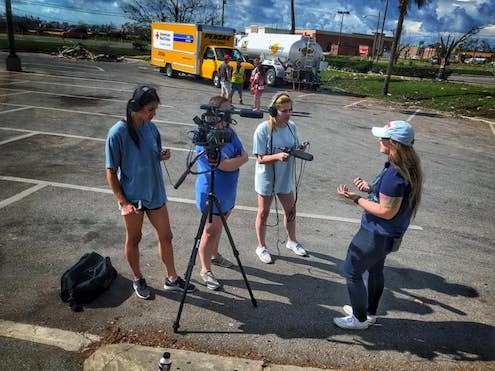 These faculty members volunteered to spend four days without warm beds or hot food in an effort to help students learn what disaster reporting entails. The students hit the ground running producing video, audio, text and photos that aired or were published on NewsWatch Ole Miss, Rebel Radio, The Daily Mississippian and HottyToddy.com. Scarpino says she will long remember her four days in Florida. Prof. Heo says it’s part of what the school does best.